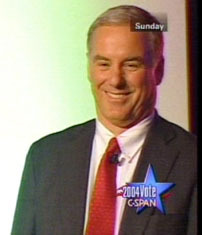 This footage is from the "Democratic National Candidates Forum" organized by the Rainbow/PUSH Coalition that took place on June 22, 2003 at the Sheraton Chicago Hotel and Towers in Chicago, IL. Here's the original question that was presented to the candidates (courtesy of Jesse Jackson). "...when the Dixie Chicks were kicked off the air for disagreeing with the President of the United States over the Iraq invasion, I suddenly realized that this was a corporation who was censoring our ability to get information on our airwaves." 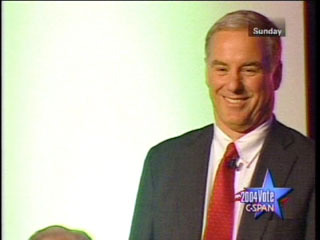 -- Howard Dean. Q: Governor Dean. The FCC made this decision. The market's gonna react. Companies are going to be acquiring more outlets. What are you gonna try to do? Try to undo it? Dean: Look, I'm not a big country music person. I like it alright. I don't know much about the Dixie Chicks. But when the Dixie Chicks were kicked off the air for disagreeing with the President of the United States over the Iraq invasion, I suddenly realized that this was a corporation who was censoring our ability to get information on our airwaves. So, yeah. Deregulation has been a failure. We need to re-regulate the media. They've behaved irresponsibly, and when people behave irresponsibly, they need to have the privileges that we're giving them using our airwaves taken away. So yes. I would re-regulate the media. I would limit the ownership of stations in a particular market and limit the overall ownerships in the entire country. We made a mistake in deregulation. We need to re-regulate.